The very end of the 19th century saw the first intrepid explorers trying to reach the South Pole. After arriving by ship they would build a hut on the ice, from which to use as a base and see out the long, dark winter. These huts were usually prefabricated kits that could be put up easily and quickly and were incredibly strong to withstand the freezing conditions and powerful winds. 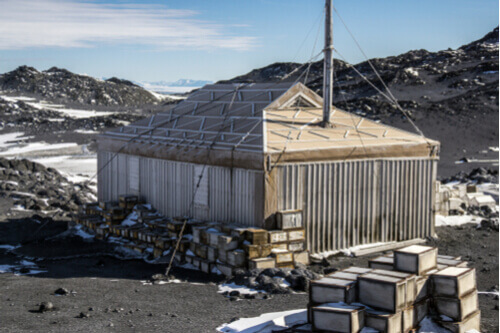 Because of their sturdy nature – and due of the dry conditions of Antarctica – many of these huts have been preserved and are open to visitors. 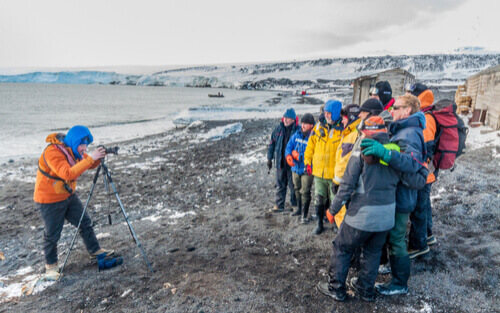 The first hut ever built on the continent was constructed in 1899 by a British Expedition led by Carsten Borchgrevink – the hut at Cape Adare still stands today. But the most famous of the huts is that of Ernest Shackleton in Cape Royds overlooking the Transantarctic Mountains and the Barne Glacier. Shackleton established the hut in 1907 in preparation for an attempt to reach the South Pole that would prove unsuccessful. The hut remains a time capsule to an era of historical adventurism. Furniture, dog kennels and even a wheel from the Arrol-Johnston car – the first vehicle to make it to Antarctica – can all be seen scattered around the hut. 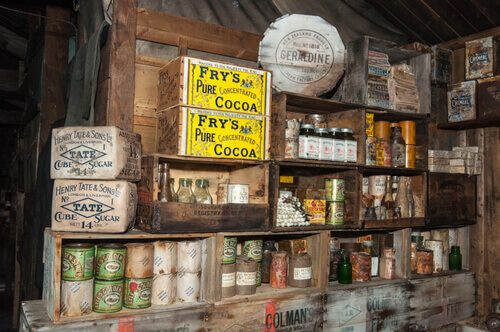 Shelves inside the hut have been stacked with provisions – tinned meats and vegetables as well as jars of preserved fruits wrapped in straw. Shackleton’s jacket can even be seen hanging on a hook and his laundry is found hanging on a line. 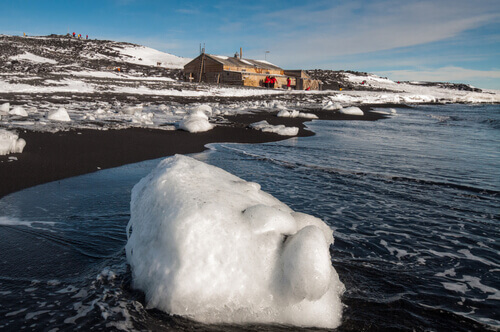 Shackleton’s Hut is protected by the New Zealand Antarctic Heritage Trust and in 2007 was restored to the condition it was left in by Shackleton all those years ago. During the restoration, five cases of whisky that Shackleton brought with him were found frozen in the ice outside his hut. Three were of Chas Mackinlay & Co’s whisky and two containing brandy made by the Hunter Valley Distillery Limited, Allandale in Australia. Scott’s Hut – found on the north shore of Cape Evans on Ross Island was built in 1911 and was built by the famous Terra Nova Expedition led by Robert Falcon Scott. Scott had actually built a hut a decade before in 1901 (known as Discovery Hut) but he decided against reoccupying it in preference of building a new hut further north. To keep it warm, seaweed was sewn into quilts, which were then placed between the walls and the roof. The flues from the cooker were used to ensure that the maximum amount of heat was used to keep it warm, and the hut was divided into living and sleeping quarters with stables for the Siberian ponies that accompanied them on the expedition. It was from this Hut that Scott and 25 of his party wintered before setting off for what would ultimately be Scott’s last fatal journey. Although it was used again in 1915-1917 by Shackleton’s Ross Sea Party, it was abandoned in 1917 and untouched until it was rediscovered in 1956 by an American expedition. When dug out from the snow it was found to be in remarkable condition, with provisions and scientific equipment still sit on preserved tables and shelves.